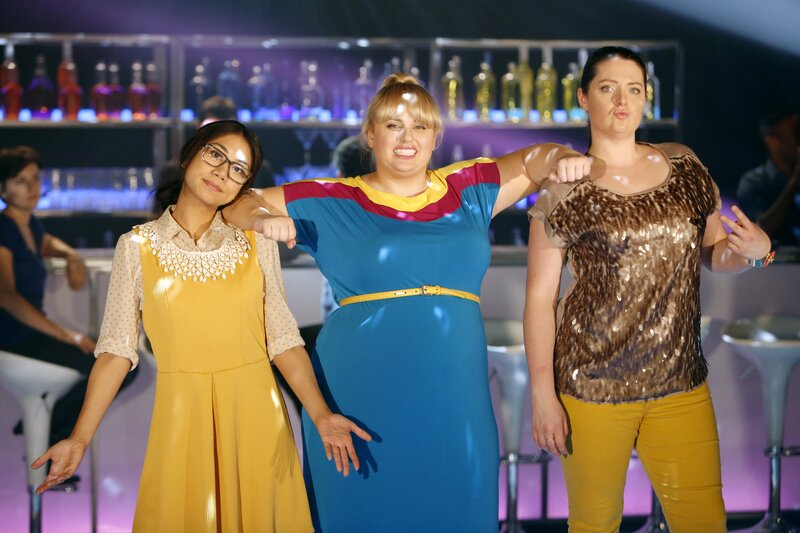 Kevin Bishop (L) and Rebel WIlson (R) © 2013 Nine Entertainment Co.
Tonight’s first episode, is in fact, the second episode of the show. Word has it, the pilot was so bad that the ABC network in the USA decided to scrap it and start with episode two, which thankfully, is funny yet still allows us to meet the characters but the idea of this “super fun night” on which the show is based, feels somewhat lost as we are starting with episode two.Sure you’ll get the idea that these girls are much more comfortable jamming around in their living room than hitting the town with their less than par social skills, but with the set-up of these girls actually taking the step to move their Friday night sessions further than the front door were all dealt with in the missing pilot episode, you’ll be left wondering why there is such an issue with these girls deciding on what activity to do next. In my previous post I talked about Kimmie Boubier’s very unique personality. You should love her, you’re meant to. She’s that clumsy girl who is still impressive enough in her job to actually be given a promotion yet has that knee wobbling fear of public speaking (the back-story of which will make you laugh) but will happily entertain the idea of a romantic interest in her boss. Her two friends, Helen-Alice and Marika, are likable too and snag some very funny scenes (watch for a photo of a possible super fun night outfit) and it’s when these girls are out on the town, do you actually understand why their Super Fun Night is in fact such a big thing. I’m enjoying Super Fun Night. If you can ignore all the fat-hate currently aimed at the show (I still don’t see the self depreciating fat jokes) and take the show for what it is, you’re sure to enjoy! The Brand New and Super Fun Super Fun Night starts tonight – Channel 9 at 8pm!